DL1000 2014 to 2018 - AdventureTech, LLC. 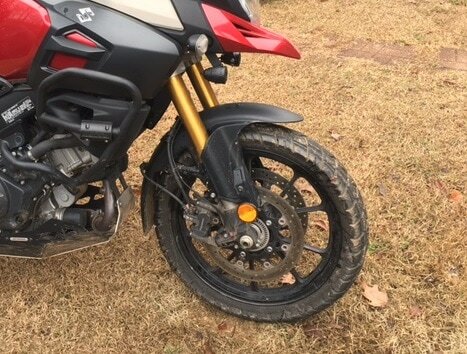 Only cosmetic changes were made to the 2017 DL1000. All parts for the 2014 to 2016 models carry forward to the 2017+ model. 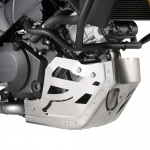 By request, a compact and ultralightweight axle nut wrench for the front and rear axle nuts of the 2014+ DL1000. This wrench is intended to be carried on the bike and used for emergency roadside repairs. Constructed out of 6061-T6 aluminum and at slightly less than 12" it fits inside a standard toll tube (agri-tube) or under the seat. We make and price these as a service to the community, so please look around the site to see if there is anything else you just cant live without. when ordering. That will soften the sting for the postage as well. Axl wrench only. Shown below with an owners tire tool used for extra leverage. Lowers Passenger Pegs as much as 3". Have you heard the rocks stuck between your tire and fender? Worried about mud build up? 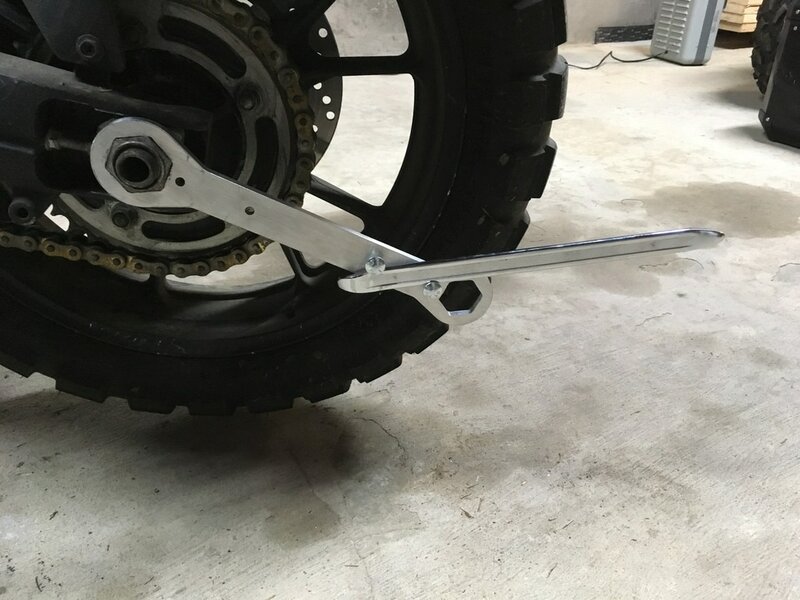 These kits allows you to raise the front fender either 0.65" with the stock brake lines, or 1.6" by relocating the cross over line lower on the back of the fender, using a longer cross over line and the stock mounting point, or aftermarket front brake lines that include a down line to each caliper (i.e., no cross over line from one caliper to the other). Especially useful for adventure tires with a more aggressive tread. 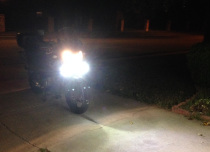 LED lights, light bars, and wiring harnesses. We carry the Shad Comfort Seat for the Vee2. Need more ground clearance? Bike too tall? Our raising and lowering linkage plates will get you fixed up (or down). Available in +1.125" and -1.0". Need a big foot for soft asphalt or off-road duty? 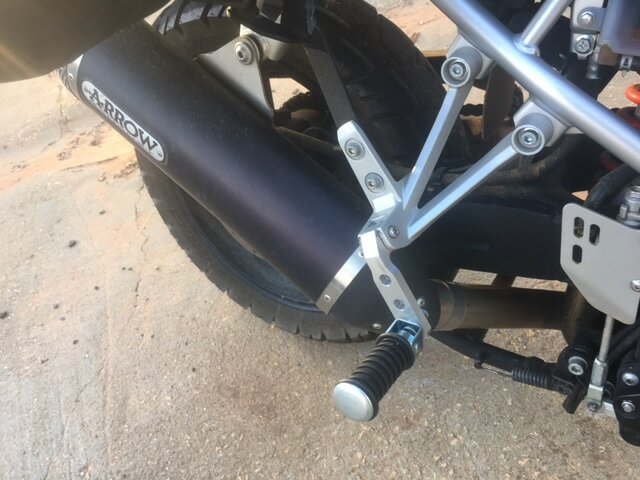 This side stand foot conforms to the shape of the stock foot for a secure fit. Need a couple more inches? These brackets provide new higher wind screen mounting holes. 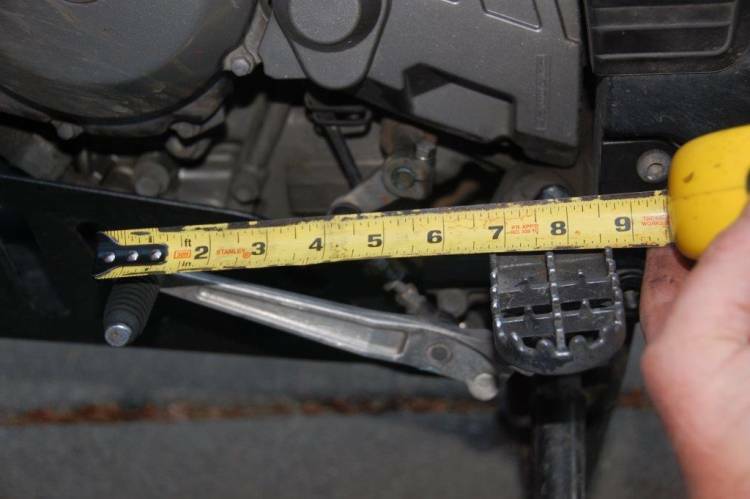 Adds between 1.52" to 2.7" effective height to your stock windscreen. Good for front two of the three windscreen positions. Not for use in the most leaned back screen position. 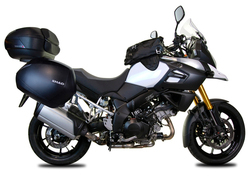 We carry the full line of Givi Windscreens. Go here for more information. Puts your GPS or smart phone just below your normal line of vision above the dash. Includes a 1" ram ball (size B). Due to the spring loaded design of the stock Vee2 windshield mount this GPS/smart phone mount is suitable for lighter weight GPS units. The over the dash shelf mounts between the windshield and the windshield support brackets. the shelf is made of 3/16ths inch aluminum, very stable, and very stiff. However, our normal bend is for the most forward position. Other bends are available on request. 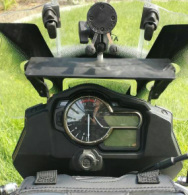 Mirror extenders dramatically improve your rear view and reduce buffeting to the rider's head. Optional farkle extension available. Top and side cases,tank bags. Chain Oilers save you money by improving chain life and reducing maintenance. We carry the new TUTORO auto oiler. 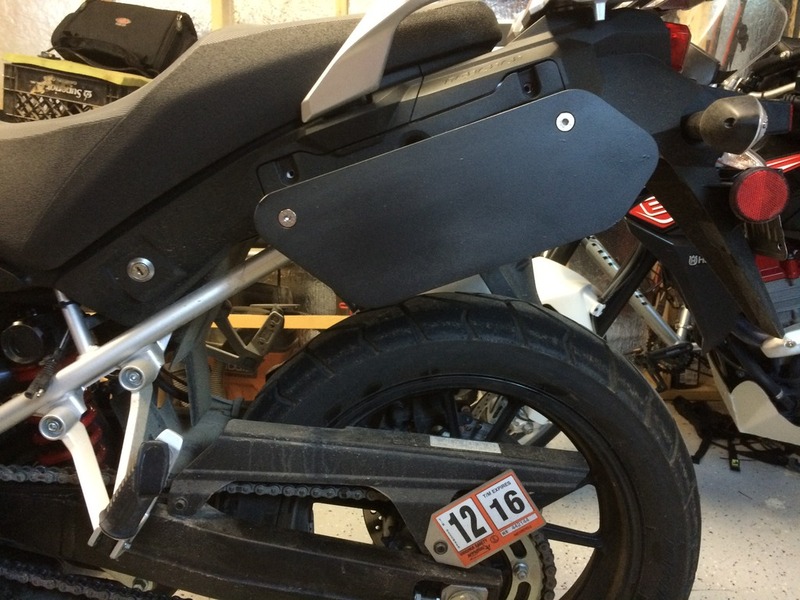 The TUTORO auto does not need to be tied into any of the motorcycle systems. The simplest auto oiler on the planet! 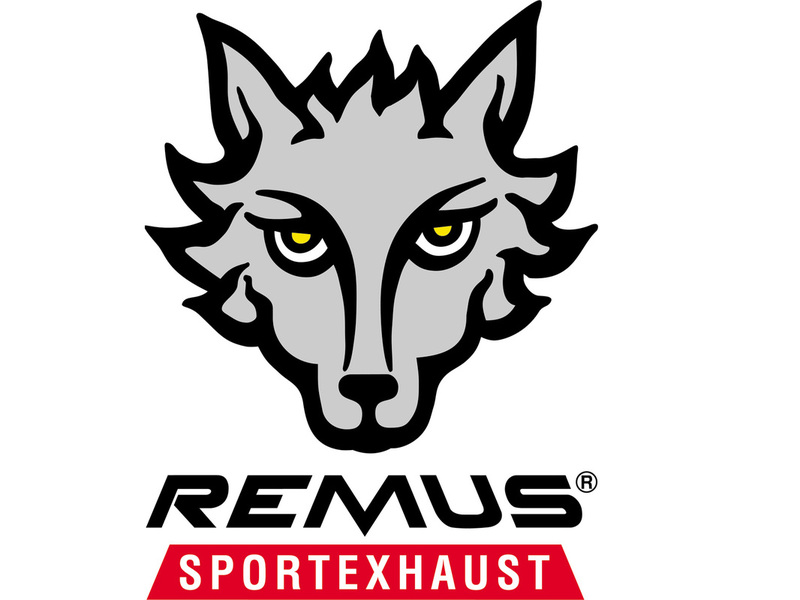 We carry two exceptional brands of high exhaust for the 2014 and newer DL1000, Arrow and Remus. By request only. 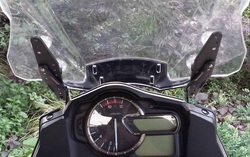 Custom auxiliary shelf for the 2014 and newer DL1000. Made to fit your components (e.g., power socket, voltage monitor, switches, etc.